I love making these biscuits precisely because they are a little fiddly. 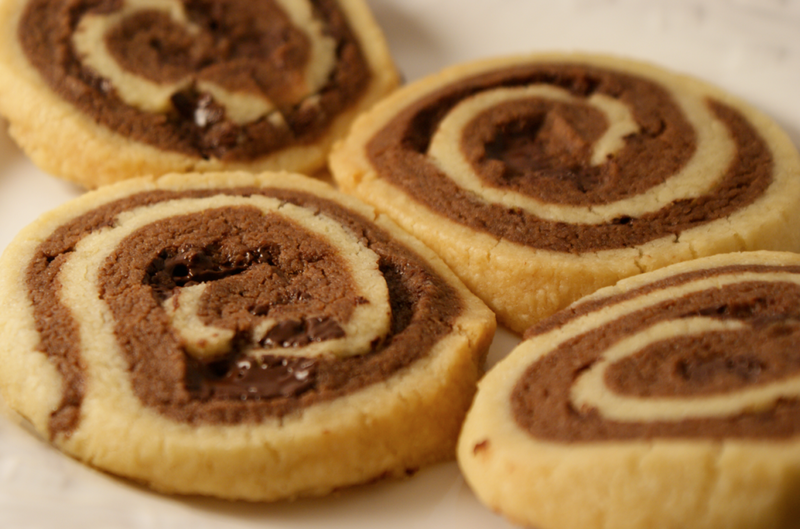 In a lot of ways it's a very simple recipe - one dough only has flour, sugar and butter blended together and the other only has the addition of cocoa powder. They just take a little time and care. A little love and affection. 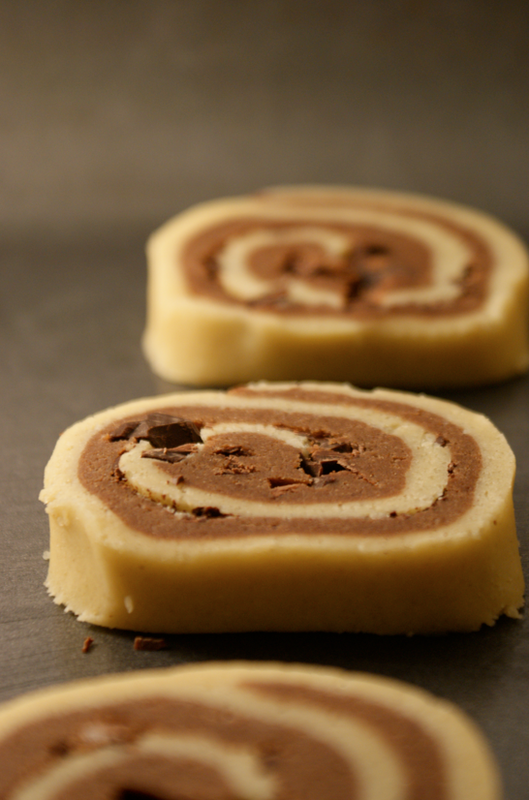 There's something very exciting about cutting each round to reveal the swirl, studded with chocolate. They're so bold and each one is individual, with their patterns of chocolate chunks and different shapes. I like perfection and order in a lot of ways, but these are improved by their individuality. The dark chunks of slightly bitter chocolate contrast to the sweet biscuit, sticking the crumbs together as you eat. 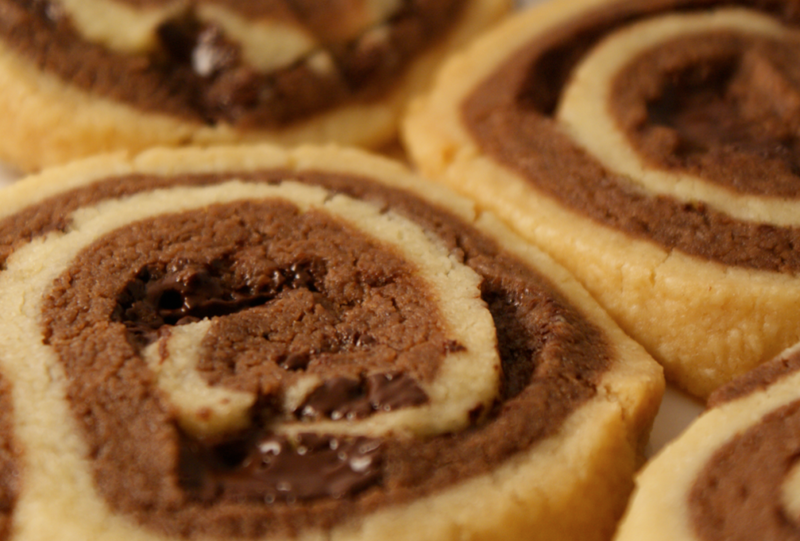 The golden swirl complements the chocolate - I wonder how many you have to eat to work out the perfect ratio to each bite? I made these for my friends at a sad time. I wanted to make something yummy and comforting. The process gave my hands something to do and filled our flat with a lovely smell. When I don't know what else to do and feel powerless and sad, I cook. They were my little way of showing of love and affection for each and every person who had one. Make the plain dough first. Start by sifting the flour and sugar into preferably a food processor but a mixer is fine. Add the butter and blend in until it starts to come together - this will take a few minutes. Form into a ball and then knead lightly. Cover with cling film and place in the fridge. Repeat for the chocolate but sift in the cocoa powder with the flour and sugar. Chill for 30 minutes. Preheat the oven to 170 C. Chop the chocolate up fairly roughly - you want a mix of slightly bigger chunks and smaller bits. Start to roll out the plain dough on a big rectangle of baking parchment into a rectangle - it needs to be about 1 cm thick - maybe a little less. 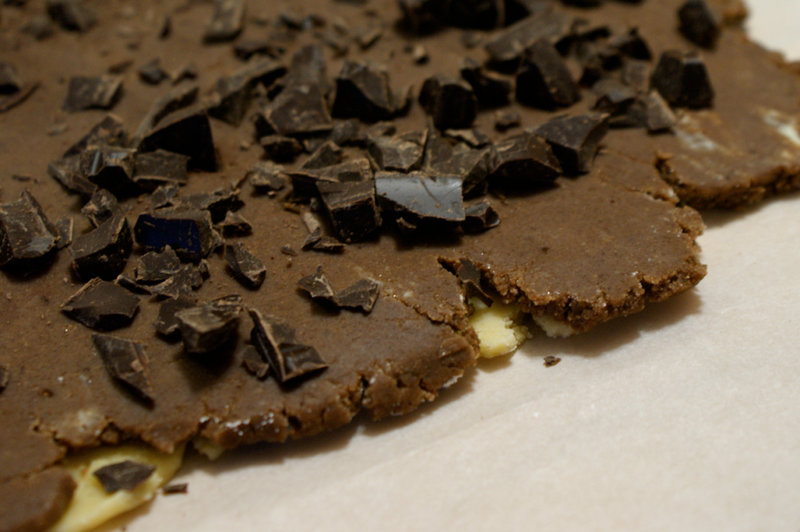 Roll out the chocolate in the same way on another bit of parchment, trying to get it into the same shape. 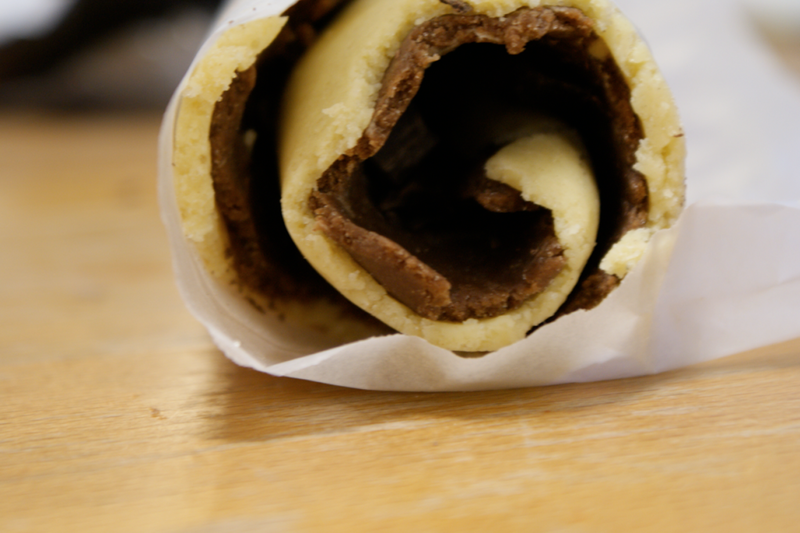 Then place the chocolate on top of the plain (with the two doughs meeting in between the two outer layers of parchment. 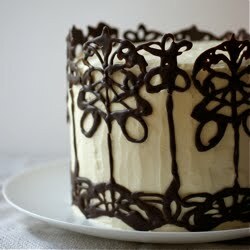 Peel the top parchment off the chocolate layer. Sprinkle the chopped chocolate on, putting the bigger lumps at one end of the rectangle and grading it down to the tiny bits at the other end. Press them in slightly. Using the parchment as support, roll it into a sausage like shape, starting with the big chunks end. When it's rolled into a sausage, cut into 1 cm rounds (you may have to re-roll up some of the end ones or just crimp them in a little as they tend to not be as tightly wound, as you can see above in my roll). Transfer to a greased baking tray and bake for 25 minutes or until golden. Cool on a wire rack. i have a similar family recipe... but i think i should try this one! I know just what you meant when you said, "when I don't know what else to do and I feel powerless and sad, I cook." I often do the very same thing. It's an activity that keeps your hands busy, while engaging your mind, and it results in something nice that can be shared. Your cookies are lovely, and it's especially appealing that this is a family recipe. I've made these before and got the recipe from Green & Blacks Chocolate recipe book if anyone's interested :) They're yummy. they look like a very very very very very nice looking chocolate swirl !!!!! It's unfortunate. I followed the recipe to a tee & was disappointed. They were bitter & needed more sugar. They look dlish though! Cristina - Oh no, I'm so sorry! I've never had any problems before. They're not very sweet but I wouldn't say they were bitter - did you use very dark cocoa powder? It's possible. The quality of my cocoa powder was not very good. I just used whatever I had in the house. I think that day was just not a good baking day. But I'm here again to try something else!